From the time I was a little girl, you always made a wish on moving hay......It couldn't be parked.......it had to be moving. My Mom always yelled "make a wish - moving hay".I'm sure some of my wishes came thru because I have wished on a zillion bails of moving hay! I know you are going to get lucky - that's too much of a coincidence. Don't forget to hold your breath when you pass a cemetary...'cause if you don't it's bad luck! I've heard of wishing on moving hay while listening to a radio show from 1942 called The Great Gildersleeve...so yes its not a myth. "When you see a stack of hay, make a wish and turn away, and never look at it again." I found this blog when looking up the phrase "hay and pig wagon (make a wish!)" because we were reading the Richard Scarry book "cars and trucks and things that go" and found the above phrase next to a picture and wondered why you would make a wish at such a thing. So clearly you weren't the only one! Around 1975 or so, my mother told me about making wishes on hay and the phrase that she used was,"See a bale of hay, make a wish and look away,"
I also learned from my mom to 'wish upon a moving hay truck when I was little. Another rule according to her was you have to keep the wish to yourself. Just the other day I was telling my husband about this and he looked at me as if I was crazy! My mother (and her mother before that) always told me about wishing on hay trucks and not looking back (the licking the thumb is new to me). She also told us to wish on vehicles you see driving with one headlight out. I wan't able to find any Google search about the headlight thing, but I was delighted to find your post about hay trucks! I appreciate the validation that came along with it. Thank you for this article, I thought I was the only one! My Nan told me this but to lick your thumb and tap it on the top of your shoe as you do it, no ideas why and there was no rhyme, which I will now adopt �� will pass this on to my kids some day too! I am in England and my dad always said "Thats lucky" when we saw a truck loaded with hay! My dad passed away last year aged 86 and I never got round to asking him the origin of the saying. My mum has no idea why they always said it. I wonder if the saying came over with the soldiers in the war and the Brits got hold of it and changed it along the way. Whatever it means I say it to my grandchildren all the time and I hope in time they will be saying it to theirs one day! 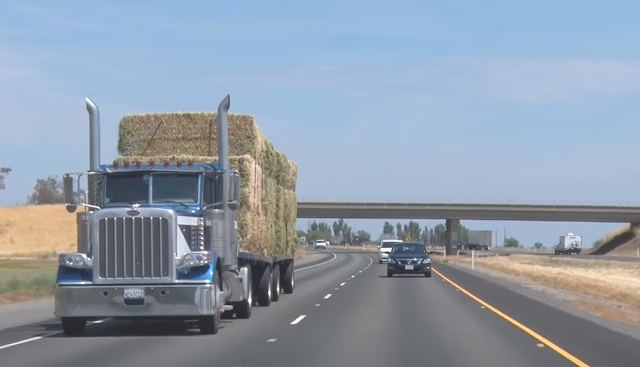 When my husband and I started traveling to Melbourne Australia from Brisbane, all of a sudden I kept seeing loaded trucks of hay and I had this urge to lick my thumb and punch my other hand! I realized that this was a long forgotten game that my grandmother must have told me about, since she lived in the country in Cincinnati Ohio! What a revelation! All those years of living oversees and I hadn’t thought about hay trucks! Because of the drought here in Australia, I have already counted 15 hay trucks loaded with hay for the farms out West! Good on them! I grew up with this and just got a bunch of crazy looks at work. My mom and dad both would lick their thumb, snap their fingers and slap their thigh as the hay truck passed.... I was beginning to think they made it up until i found this thread! !